That’s right! This years big funraiser (and yes, I DID spell it right!) 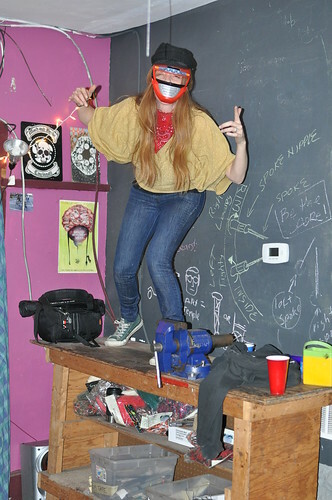 party is going to be BIKE PROM!! So get your date, get your tux straight, pick a purty flower and put on your dancing shoes. Stay tuned for all pertinent details. And if you are interested in making this grand gala happen, the bring your happy self to the Comet next Thursday, March 1st, at 8:30 pm to begin planning. If you can’t make it, get with me, Rob, at Mobo, or through the email. Check out the skirt guards to protect your pretty prom dresses! Also, in regards to my last blog discussing the running of your lights….. really, go with your gut. If you think you’re rolling through somewhere you could get mugged, maybe you shouldn’t advertise yourself. Otherwise, run your lights so cars can see you. That’s all. Its just food for thought. 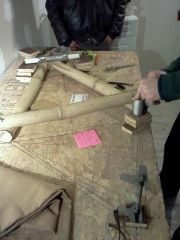 Building the jig for the bamboo bike. Neato torpedo!! 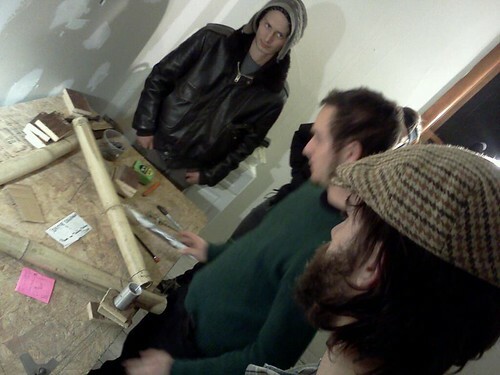 MoBo had an impromptu bamboo bicycle building workshop last week. The workshop was held by past MoBo member, Dan Vogel-Essex, of Ozon Bicycles. Currently based in Berlin, Germany, Dan was in Cincinnati visiting family and friends and stopped by the Co-op. One thing led to another… after hours, resins purchased, a crew of people cutting up bike frames to use, extremely rich and delicious Ghirardelli chocolate brownies, and a custom bike jig. Dan explained the process, showed critical points to look out for, answered questions, and was ultimately patient with us all. Kudos! 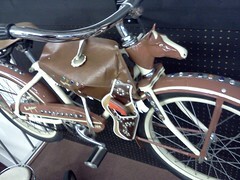 He even agreed to donate it to MoBo’s Loaner Bike Program! Well, the bike is looking great. 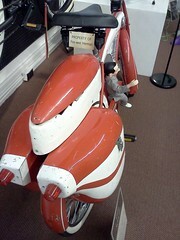 Dan has flown back to the DDR, and we’ll be finishing up the final touches of bike soon. 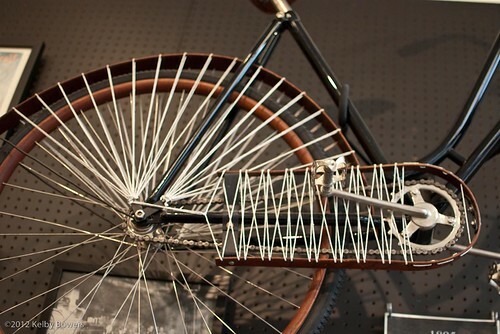 Ask about it next time you’re in open shop and keep an eye out for it pedaling around soon! 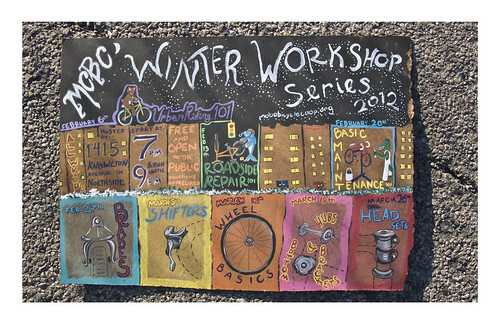 Our Winter Workshop Series begins February 6th! All workshops are free and open to the public. Workshops will be held at Mobo (1415 Knowlton) from 7-9pm. All are welcome! Have you ever heard of the “right hook” or the “door zone”? Do you know how to correctly lock up your bike? Urban Riding 101 is a great workshop for those who are new to riding on city streets! This informal group discussion will cover: how to dress for the cold (so you stay warm, but not sweaty! ); basic street safety (right hooks, the door zone, metal plates, making turns, lights, bells); gear for commuting/running errands (weight distribution and securing of cargo for racks, panniers, baskets and messenger bags); recommended routes/roads; and how to correctly lock up your bike so it doesn’t get stolen! What a year. We have kept ourselves busy. Mountains of work have been moved. Frustrations and worries expressed. Laughter, hugs, and love found. Sometimes we’ve been awkward. Sometimes we had trouble communicating. Sometimes we got angry. And we recognized that and its ok. Its a new day and a new moment even as these words appear. What will we accomplish next? So many people have given so much. Time, energy, materials, advice, love, support, understanding, critiques, friendship, inspiration… the list goes on. All gifts. All blessings. All of it channels back out of MoBo. Its a smile, a helping hand, a presence, a reassurance, a support network that ripples out the doors of the shop to flow around our neighborhood and even the whole of Cincinnati itself. Amazing the things that have been accomplished through the existence of a tiny little community bicycle workshop. What will happen next? Will we we continue to as a tiny little workshop? Will we inspire a child? Bring understanding & peace to tensions and discomfort? Share jokes? See more and more people riding bicycles down the street? Will we continue to build a place that that vibrates with life and friendship each time we sign in? There have been as many ideas shared within those walls, as seeds have been planted in the surrounding gardens, as the turns of the wrenches each week, as rotation of the wheels of your bike when its all said and done. Endless possibilities. Potential roadblocks. Only way to see what happens is to keep taking part part, isn’t it? It won’t be easy sometimes. Sometimes it will be epic. Other times humbling. And, hopefully, we all come out for the better. How will we come to MoBo in the new year? What can we give to it? How can we help? And when its figured out, it feels good.